Whether we're ready for it or not, cold winter weather is upon us. In fact, I had to turn on the furnace for the first time this week, as it was 22 degrees outside and 59 degrees inside the house when I woke up to see my husband off to work. Living in an area with extreme winter temperatures, having the proper clothing to keep warm is essential! I recently received a pair of boots from Oasap and I'm in love! They are super soft, comfortable, and most importantly... WARM! 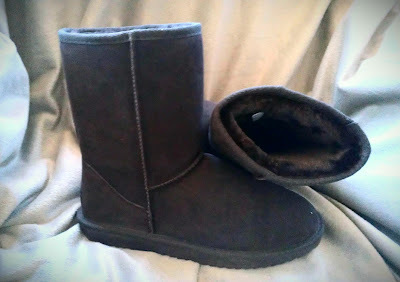 They keep my feet toasty and dry, and are exactly what I was looking for. These warm and comfortable wool lined boots are available in size 4 - 9! They are also available in a variety of colors to match any personality or wardrobe: black, chestnut, chocolate, light pink, grey and sandy! Crafted in quality cowhide, featuring, a classic middle design with a contrast bound trim to the edges, 50% wool and 50% faux wool lining, thick rigid sole, warm and durable. Even though they are too big for her, my daughter has been trying to steal them from me. She's begging me to order a pair for her, just like mine! She might just get her wish, because I'm debating on whether or not to order myself another pair (or two) in different colors! Oasap carries a large variety of fashionable women's clothing and accessories. Dresses and blouses, boots and heels, clutches and purses, belts and jewelry! You're going to find several items that you instantly fall in love with! The only dilemma you're going to face is choosing which item(s) to purchase first! I really love those boots! They are so cute and look incredibly warm! We don't get much snow down here in the south, but it does get cold, and I sure would like a pair of these to keep my feet warm! Those boots look SO comfortable. Out of all the boots I have, I don't have any like that! Def need to get me some! What a great price for those boots too! I'd expect to see them $100 or over, these are less than $60! They look incredibly comfy too. Too cute! Those will come in handy when the weather gets colder. I have hard wood floors and love something warm to wear around the house. These look so cozy! We just got our first hint of chilly, fall weather this weekend, so I'm definitely going to check these out! Those boot look so comfortable! The weather has become cold around here, I think I need a pair! Those look so comfy and warm! Those look so cozy! Living in Colorado I can always use cute boots. Those are so cute and look so comfy and warm! They would be perfect for our frigid winters here in Cleveland. love those boots. they look so warm!! These would be great when we are back in Ohio to keep my feet extra warm!